Twenty percent of Americans say they can't always afford the food they need. But, thankfully, much fewer truly go hungry. Thanksgiving is the time of year when soup kitchens swell with volunteers and food pantries go into overdrive, dolling out turkeys en mass to the needy. Thanks to our fondness for holiday charity, it's may well be one of the days when the fewest Americans go without a meal. But how bad is this country's hunger problem the other 364 days of the year? Just in case the season has you wondering, here's a holiday FAQ to answer your questions. We're such a rich nation. How many Americans could possibly go hungry? Well, more than before the recession, for sure, but thankfully fewer than some headlines might make you think. It's safe to say that in about 6 out of every 100 homes, someone is forced to go without food during the year. Tens of millions of Americans have at least a bit of trouble affording meals. In September, for instance, 20 percent of adults told Gallup that at some time in the past year, they didn't have enough money to buy the food their family needed. And, as you might suspect, that's pretty sad by International standards. According to Pew, Americans are far more likely to say they have trouble affording food than citizens of most other rich nations. We're more like Indonesia in that respect than Germany or Britain. But having difficulty purchasing food isn't quite the same as going hungry, which the U.S. Department of Agriculture makes apparent in its annual Report on Household Food Security. First, the big picture: hunger rates jumped after the recession, and have yet to come down. In 2012, 14.5 percent of households suffered from some form of food "insecurity," which essentially means they had to worry about putting dinner on the table, might not have been able to afford a balanced diet, but weren't necessarily skimping on meals. The upshot: almost 49 million adults and children couldn't always count on where their next bite was coming from. Thankfully, a much smaller subset of those people actually experienced serious hunger. According to the USDA, only 5.7 percent of households dealt with "very low food security" at some point during the year, which means someone in the home was actually skipping meals or cutting portion sizes. In total, some 17 million Americans, including 8.2 million children, lived in those homes. Wait, are there really 8.2 million hungry children in this country? That's basically the population of New York City. Well, it's not quite that bad. In most of these households, parents choose to skip meals instead of their children. (To be clear, when I say, not "that bad," I'm speaking very relatively. Of course nobody should have to forgo dinner so their kid can eat.). 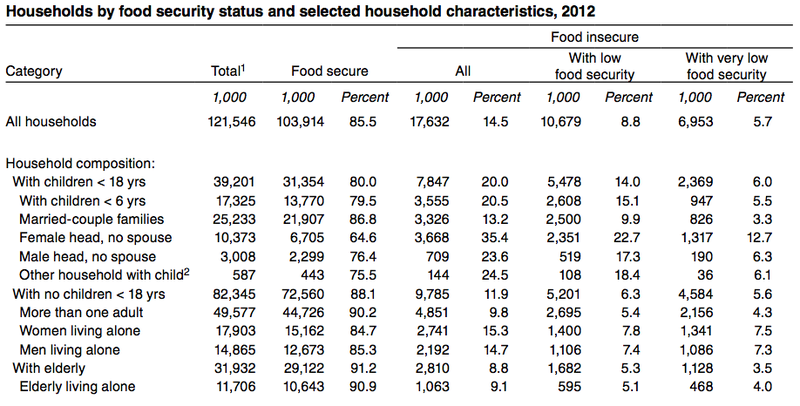 Ultimately, kids went hungry in just 1.2 percent U.S. homes last year. That comes out to 977,000 Americans under 18. Which is still pretty heart wrenching, if you think about it—it'd still be enough hungry kids to fill a city the size of San Jose. But at least it's not millions. So are these families starving every day? Thankfully no. The USDA asks households if they've experienced hunger or had trouble affording food any time in the past year or past month. And as shown below, it estimates that just 1.1 percent of households on a given day are probably dealing with true hunger. That said, the hungriest households do cope with these problems repeatedly throughout the year. 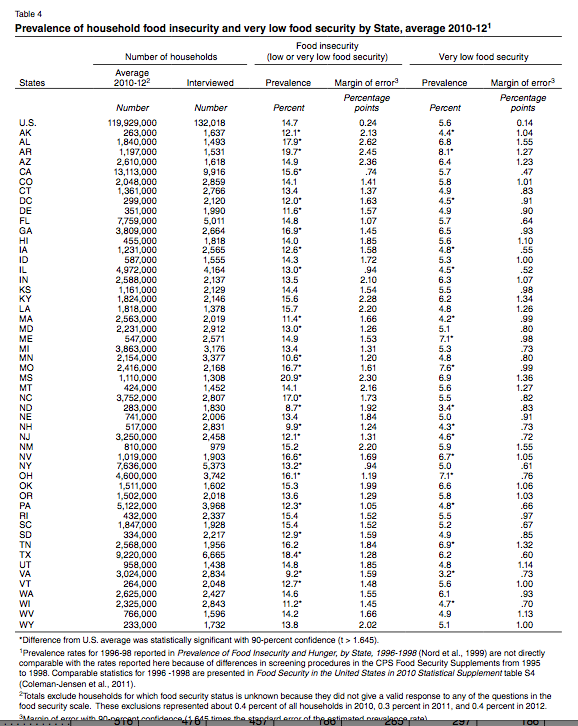 As USDA notes: "Typically, households classified as having very low food security experienced the condition in 7 months of the year, for a few days each of those months." Is the problem just as bad all over the U.S.? Just like poverty, there's an enormous amount of geographic variation when it comes to hunger in the U.S. As this map from the Hamilton Project shows (click for an interactive version), child food insecurity is worst through the Sun Belt and West Coast. It's much less severe in parts of the Midwest and Northeast. Which families are most likely to be hungry? The obvious answer here is: poor ones. But, to be more specific, households headed by single mothers have it worst: 35 percent of them qualify as food insecure, more than double the national average. A full 12.7 percent suffer very low food security, which again, means they really are lacking food. Meanwhile, almost a quarter of Black and Hispanic households deal with any kind of food insecurity, compared to just 11 percent of whites. Don't we spend billions of dollars on food stamps? Why doesn't that help? Well, it does. There are about 47 million Americans enrolled in the Supplemental Nutrition Assistance Program, aka food stamps. They receive, on average, $133 per month, and yes, it costs us about $70 billion. And the government's efforts to help them, about half of all SNAP households still deal with some level of food insecurity. Some conservatives have argued that means food stamps aren't very effective at combating hunger. But to me, their logic is sort of backwards. A lot of these families are living so close to the edge that, even with government help, they have difficulty getting the food they need. Take this Thanksgiving as a demonstration. Food stamps were recently cut by $5 billion, thanks to an expiring piece of the stimulus act. As a result, a family of four getting the maximum benefit lost about $36 a month. That might sound like a dinner out to you or me, but according to the government, it's actually about enough to feed an adult woman for a week. And, lo and behold, food pantries are reporting an influx of new customers, whose benefits seem to be running out earlier in the month than usual. They're always busy this season. But sadly, they're going to be even busier this year.